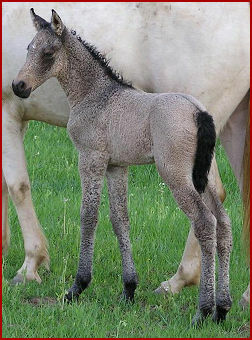 DCC Creme De Cocoa is a stunning buckskin Missouri Fox Trotter. She has the unusual and rare trait of being curly haired, due to a dominant gene that traces back to a gaited curly stallion named Curly Jim. "Cocoa" is out of the straight haired smoky cream mare, Della, who can be seen in the previous photo. Thankyou to Lisa Perry of Zion's Gait Curlies for allowing me to display this photo of their gorgeous filly.